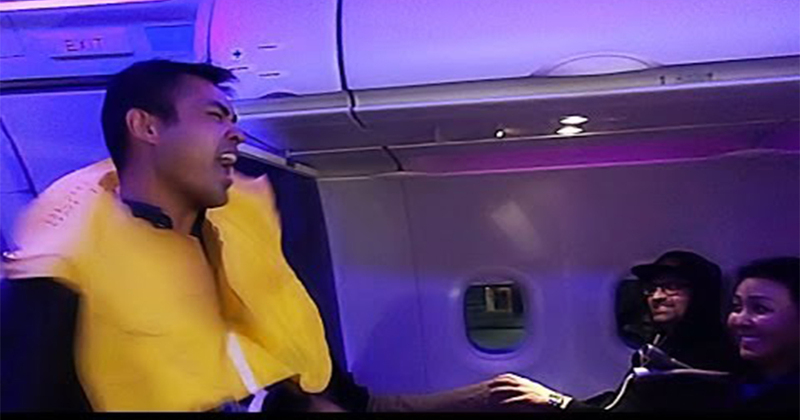 Virgin America flight attendant Mikey Tongko-Burry gives one final performance of his safety announcement routine before the airline shuts down. Videos 31 July, 2018 . Written by Peter Dunne. For regular fliers of Virgin America Airlines, flight attendant Mikey Tongko-Burry has twirled into their hearts, recognisable for performing the safety announcements with gusto. Not one for the basic robotic point and direct, Mikey goes all out incorporating a hugely entertaining dance routine. But just how has the flight attendant been able to perform the announcement? A recorded emotionless voice doesn’t exactly fill dance floors and get feet tapping. Well, it’s because Virgin America uses a famous ‘Safety Flight Song’ – a musical version of the instructions which has already proved to be popular on YouTube. The tune has been praised for being an announcement which people not only listen to, but sing along with, meaning they know all the lyrics, sorry, announcements by heart. Even still, with such a high energy track, you need a high energy interpreter to really get the best out of it. That’s where Mikey’s past training comes in. Tongko-Burry is a previous medal winner for ice skating, and the champ has adapted those slick moves to transition from ice rink to aisle carpet! Over the years quite a few passengers have been lucky enough to witness and share his antics. He really knows how to work that inflatable vest! Sadly, with the news the airline is to merge with the currently embattled Alaska Airlines, the ‘Safety Flight Song’ will soon be retired. Along with Mikey’s interpretation. Many took to Twitter to wish him a fond farewell, including Friends actress Aisha Taylor. You can’t keep a good performer down though, as in Mikey’s own nostalgic tweet about his time with Virgin America coming to an end, he mentions he will soon be wearing the uniform of new airline Alaska Blue. So with Mikey due to take the skies once more, it seems only fitting the merged airlines make up a whole new safety song for Mikey to dance to… sorry, we mean – for passengers to listen to. 31 July, 2018 . Written by Peter Dunne.